There was a remarkable two-year gap in Bowie's early career where he released no product - between his third flop single for Deram, a re-recording of Love You Till Tuesday, in May 1967, and his first milestone, Space Oddity, in July 1969. Bowie's career would not see such inactivity again until two decades later, when he took a breather to reconsolidate his critical stock after the commercial and critical failure of Never Let Me Down. The boy David had been far from idle, however. Christmas 1967 saw his first Radio 1 session, and he made his first contributions to his film career by obtaining a walk-on in The Virgin Soldiers starring Hywel Bennett, danced in BBC's The Pistol Shot and advertised a new ice cream called Luv - "a special ice lolly for hippies", as Simon Hepworth of Q magazine later quipped when the footage surfaced on The Old Grey Whistle Test twenty years later! While numerous attempts to impress the stony-faced Decca selection panel with convincing stabs of folky pop-psych would languish in the vaults until 1970's The World of David Bowie, he began to evolve into a multimedia entertainer, under the tutelage of Lindsay Kemp and accompanied by John Hutchinson, his guitarist since the Lower Third, and another one of Kemp's dancers, the impossibly named Hermione Farthingale. Although Bowie, still keeping pace with the latest trends, had left the Tommy Steele-meets-Syd-Barrett incarnation of the Deram album behind, his manager Ken Pitt was still making bids at fashioning Bowie into an all-round entertainer. When the Deram deal folded, Pitt personally bankrolled a half-hour music film, Love You Till Tuesday, which he failed to sell to various TV stations as a TV special - unsurprisingly, since neither of the two UK TV stations would be likely to devote half-an-hour of airtime to a failed pop star with a string of flops to his name. Nevertheless it remains a curio, as it captures Bowie between two incarnations, devoted as it is for the most part to tracks from the Deram period, enhanced in pseudo-stereo and embellished with Hutch and Hermione's harmonies. Nonetheless, three particular sequences give a glimpse of things to come. Bowie performs and narrates a story that anticipates themes which he would later not only expand upon, but also enact on and offstage when he play-acted the Ziggy Stardust story across the halls of Great Britain in 1972 and 1973. Two other, specially-written pieces also signal where Bowie was headed next. The original piece Ching-A-Ling preserves for future generations the Feathers trio in full-on folk action, resembling nothing so much as Rainbow's Rod, Jane and Freddy, and is notable for featuring a haunting, fairground melody during the chorus which Bowie would repurpose eighteen months later for The Man Who Sold The World, when the melody was reconfigured for a queasy-sounding Moog synthesiser refrain on the track Saviour Machine, a slab of monolithic sci-fi updating the apocalypse of the Deram album's darkly comic We Are Hungry Men. If nothing else, this is interesting as it denotes how early on Bowie would file away unused or unrealised motifs only for them to resurface years or decades later in other songs. Nothing is ever wasted! The third and final piece, which closes the film, is the original version of Space Oddity, in a relatively spartan arrangement, with a cute video seeing Bowie's spaceman bewitched by blonde space maidens, betraying the song's ultimately cynical, alienating theme. According to Ken Pitt, the song passed "the whistle test" when the cameramen of the short film took to calling Bowie 'Major Tom', and out of this last ditch attempt to market Bowie as a lightweight pop performer with something for everyone, Bowie and Pitt finally had the calling card to kickstart a new period of commercial viability. 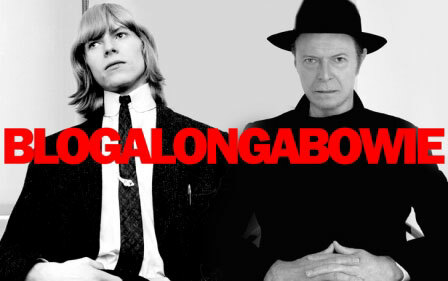 Shortly after Love You Till Tuesday wrapped, languishing in the vaults until PolyGram released it on VHS and LP at the height of mid 80s Bowiemania (when, ironically, he achieved the kind of mainstream success Pitt had always aspired to for his young charge), Hermione Farthingale left David, inspiring some first-rate bedsit odes of lost love on his second album, and herself becoming a part of Bowie mythology, remaining an enigma to Bowieologists evermore. Feathers were reduced to a duo, Bowie and Hutch, now modelling themselves on Simon and Garfunkel, the golden boys of 1969 with their family-friendly toe-tapping acoustically-based catchy songs of baby boomer alienation. Sometime in early 1969, they visited Mercury's Knightbridge office and used their recording equipment to fashion together a demo tape for prospective music publishers, a tape which would surface in the late '80s as the bootleg The Beckenham Oddity. It's a remarkably unprofessional and quaint document, with some shambolic patter between songs, in which Bowie apologises for background noise caused by "Mrs. Fahrenheit", the piano teacher upstairs, makes some in-jokes about the close-knit, grass-roots folk music scene, namechecking Roy Harper and Tyrannosaurus Rex, and essay rough and ready acoustic versions of songs which would later grace Space Oddity, alongside two covers that were part of Bowie's repertoire - notably Love Song, the song written by Lindsay Duncan, who briefly replaced Hermione as Bowie's casual love affair and muse (the song was later covered with some success by Elton John on Tumbleweed Connection). Space Oddity is present and correct, with Hutch as "ground control", and a Stylophone donated by Marc Bolan warbling tunelessly away to give the song a sci-fi feel, while Bowie's nakedly confessional Letter To Hermione is introduced with the less revealing title I'm Not Quite. An off-cut from the much-bootlegged demo tape, Lover to the Dawn, eventually surfaced on a 1990 bootleg CD, Naked & Wired, and is fascinating in so much as it is a very early prototype of Cygnet Committee, the sprawling, nine minute epic that closes Space Oddity's first side in grand fashion. In its original incarnation, it candidly betrays how much Bowie was following the stylistic beats of introspective, confessional and wistful folk of the time, before it was remodelled beyond recognition as by far the darkest track on Space Oddity. The demo, for all its lack of smooth edges, did the trick, as Bowie, in 1969, found himself with his fifth record deal in as many years and a song under his belt which tapped into the "Moonmania" of the imminent Apollo moon landings and owed a clear debt to Stanley Kubrick's cryptic, psychedelic, era-defining 2001: A Space Oddysey. Bowie found himself signed up with Philips, the domestic division of Mercury Records, poised to end the Sixties with the success that he had been craving for the best part of a decade, and with another sudden change of dramatis personae waiting in the wings to usher in another chapter of creativity and inspiration.